Original Malpassi replacement seals for the Malpassi Filter King Fuel Filter and Pressure Regulator 85mm. 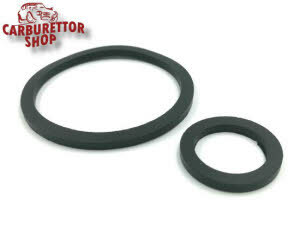 These original Malpassi seals replce both the bowl seal as well as the filter seal in the 85 mm versions of the Malpassi / Filter King fuel pressure regulators. This is the version with six screws in the top cover. The version with four screws is usually the 67 mm version. Seals for the 67 mm version can be found HERE.